Good news everyone! I’ve finally settled into my new studio, my below-minimum-wage assistants have unpacked all my gizmos and gadgets and, assuming the aforementioned lackeys have plugged everything in correctly, I will broadcast a brand spanking new Hubie Sounds show this Tuesday night. To celebrate this momentous occasion, I will be dedicating this particular show to some of the greatest record labels to have ever graced our aural passageways. In this (not) cunningly titled Classic Labels Special, I will spin big tunes that represent each of my favourite record labels, including music by the likes of Fatboy Slim, Underworld, New Order and DJ Shadow, and from labels such as Junior Boys Own, XL, Ninja Tune, R & S and loads more. 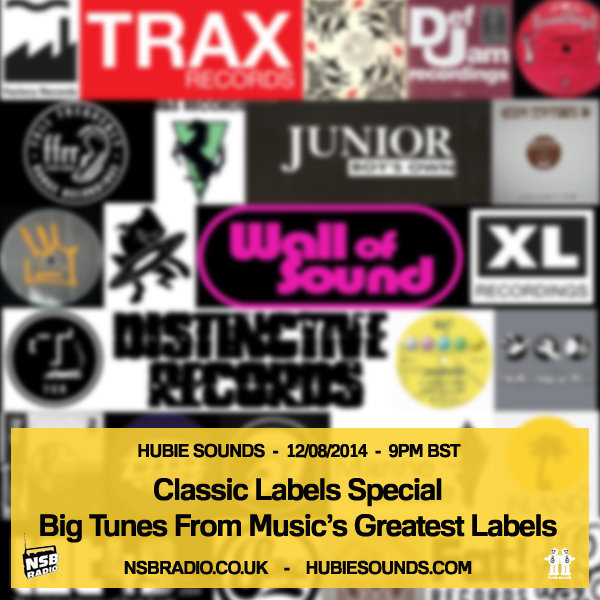 The Hubie Sounds Classic Labels Special – Tuesday 12th August @ 9pm BST – live and direct on NSB Radio! Make sure you come and say hello in the NSB Chatroom too! This entry was posted on 11 August, 2014 at 10:31 am and is filed under Live Radio. You can follow any responses to this entry through the RSS 2.0 feed. Responses are currently closed, but you can trackback from your own site.